Now that the presidential election is over we can hopefully look forward to some respite from the perpetual bombardment dished out by both the Republican and the Democratic Party machines. President Obama has been re-elected so we can expect four more years of a Washington centric controlled economy with a rolling program of borrow, print, spend and pretend, similar to the last four years. The so called fiscal cliff will not be met head on, the approach will be one of extending some of the tax cuts now in place and a watered down strategy of fiscal prudence. Budget ceilings will come and go and the deficit will grow ever larger as the economic recovery will be considered far too fragile for any serious attempts at financial reform. All in all nothing has really changed, the slow motion train crash will continue and the fallout will affect everyone. One of the casualties will be the dollar as quantitative easing will be applied in ever increasing doses, devaluing the dollars’ worth and its buying power. However the race to the bottom is alive and well as other nations will adopt similar strategies in an attempt to remain competitive and so Act Two reads like Act One. The chart below shows the 50dma crossing over the 200dma in a downward motion which is sometimes referred to as the ‘cross of death’ as it usually signals that a negative move is upon us. We now expect the dollar to drift lower and test the ‘72’ level on the US Dollar Index. The demise of the dollar and other fiat currencies brings with it an increase in the price of hard assets. Over the last decade or so our hard asset of choice has been the precious metals sector, mainly physical gold and silver and they have served us well. Individual investors have their own unique preferences, some preferring land, property, fine art, other commodities, etc. As we don’t have any expertise in those areas of investment we will leave them for others to comment upon. The chart below shows that gold prices have been through a lengthy period of consolidation following an all-time high formed in 2011. We draw your attention to the 50dma which has crossed over the 200dma in an upward motion which is sometimes referred to as the golden cross. Also note that gold returned from its recent high to take tea with the 200dma, which is a real good starting point for its next rally. 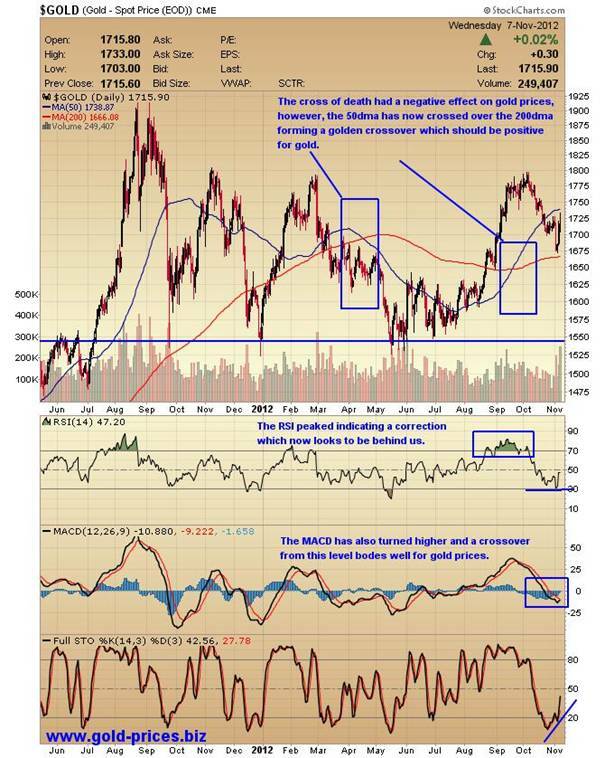 The technical indicators are turning up from a low level and the MACD looks likely to form its own crossover suggesting that that gold prices are about to move higher. 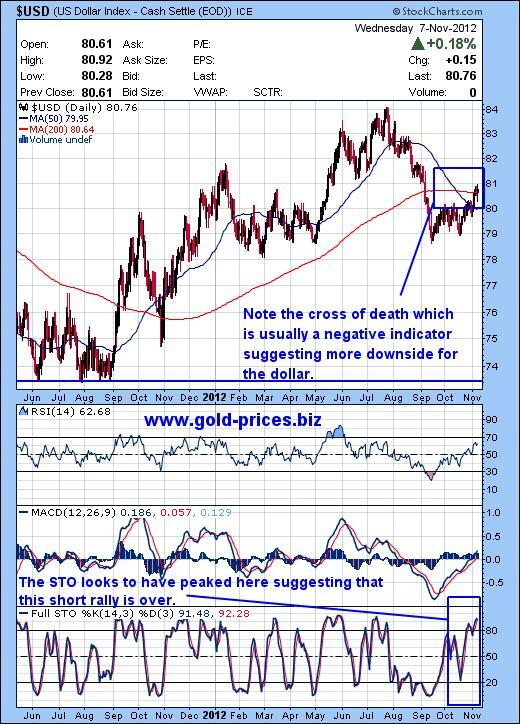 Our own opinion is that gold and silver will rally from this point through to the early part of next year making now a good time to accumulate more of the physical metals. Once above the $1800.00/oz level gold will be well positioned to make a run at a new all-time high. We also expect silver prices to catch the wind and move to much higher ground. The gold to silver ratio currently stands at 54, if this ratio were to contract, as we suspect it will, then silver prices could well and truly explode, just as it has done in the past. So stepping out and acquiring a few more ounces of silver should also serve you well. Alternatively, investing in a small selection of good quality gold producers is the preference of many investors and indeed we were buyers of such stocks in the early years of this bull market. At the moment we are not enthusiastic about them as they appear to lack the ability to keep pace with gold as evidenced by the HUI (the gold bugs index of un-hedged gold producers) which is trading at a disappointing 485.56. Please don’t be put off by us though as many of our peers see the mining sector as a good buying opportunity at these levels. Finally, move out of the folding stuff as and when you can and acquire some hard assets in a sector that you are comfortable with and be prepared to work your socks off as none of this is going to be easy, it is going to be a white knuckle ride with violent oscillations being the order of the day. If you can find the time to do your own ‘due diligence’ then you should survive and even prosper in the coming years so please give your own financial situation the attention it deserves.